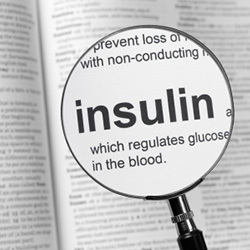 Insulin is hormone that’s made in the pancreas and works throughout the body. Its job is to regulate your blood sugar levels and to control the amount of energy that you put into and take out of your fat stores. Insulin resistance means your body stops responding to insulin the way it should. Insulin resistance messes up your energy balance and storage. Without careful treatment and lifestyle changes, insulin resistance increases the risk of weight gain, high blood pressure, diabetes, heart and liver disease, and cancer. Doctors aren’t sure exactly what causes insulin resistance. It’s a complicated set of internal reactions and nonresponses that can lead to the diseases mentioned above. One problem can lead to another or worsen an existing problem. For example, insulin resistance increases the risk of gaining weight, but being overweight can increase the risk of insulin resistance. It’s a pretty grim catch-22. In other cases, it seems that some people may be genetically predisposed to develop insulin resistance. Recently, researchers have found that eating too much sugar can contribute to insulin resistance. What we do know: If a person develops insulin resistance, insulin can’t do its job as well, so the usual amount isn’t enough to properly process the energy in the food you eat, usually in the form of glucose. This means the pancreas produces more and more insulin to help the body process glucose. What’s wrong with extra insulin? Heart disease: Too much insulin can damage the lining of the arteries (the vessels that carry blood away from the heart). It also can raise triglyceride and LDL (“bad”) cholesterol levels. Both of these can increase the risks of hardening of the arteries and blocked vessels. If the blood supply to the heart muscle is cut off, the heart muscle cells can be damaged and die off. This is a heart attack. Cancer: High insulin levels may increase the risk of certain types of cancer. In particular, studies have found a link between higher insulin levels and colorectal and endometrial cancers. High insulin levels can cause inflammation, which stresses cells and triggers the production of a range of chemicals and hormones that can damage cells directly or turn on unhealthy cell growth. Polycystic ovarian syndrome (PCOS): Studies suggests that extra insulin also plays an important role in developing PCOS. With PCOS, a woman’s hormones are out of balance. PCOS can make it hard to get pregnant and also may cause other problems, including excessive hair growth and ovarian cysts. Hypertension: Extra insulin increases the amount of sodium (salt) that the kidneys hold onto, which can lead to high blood pressure (hypertension). Hypertension is a risk factor for aneurysm (weakening and ballooning out of the blood vessel walls) and stroke, as well as for heart problems, including heart attack. It’s also a cause of chronic kidney disease. Type 2 diabetes: After many years of insulin resistance, the pancreas eventually can’t keep making so much insulin. When it can’t keep up any more, blood sugar levels stay dangerously high, which can lead to type 2 diabetes. By itself, insulin resistance alone doesn’t have specific symptoms, so often it isn’t diagnosed. Doctors don’t routinely check insulin levels in people without diabetes. Still, as more research is done, we’re starting to realize that insulin resistance may be very common and may start much earlier than we expect. Anyone who is overweight — especially if she or he regularly eats a lot of sugar — could have some degree of insulin resistance, according to experts. This captivating public service video shows the harmful effects of too much sugar better than anything I’ve ever seen. The first step in reducing your risk is to determine what your risk is. Doctors don’t usually test for insulin resistance. The most accurate test, called the euglycemic clamp, is costly and too complicated to use in most doctors’ offices. The euglycemic clamp test takes about 2 hours. Your insulin level is raised to a certain high level and kept there by giving you insulin through an IV. Then you get a glucose solution through another IV to keep your blood sugar level constant at a normal level. Your blood sugar levels are measured every 5 minutes so your doctor knows how much glucose you need to keep your blood sugar level normal. Basically, the test is measuring how much glucose you need to compensate for the higher insulin level. The amount of glucose you need during the last 30 minutes of the test determines your insulin sensitivity. More than 7.5 mg/min of glucose means you’re insulin-sensitive. Less than 4.0 mg/min means you’re insulin resistant. 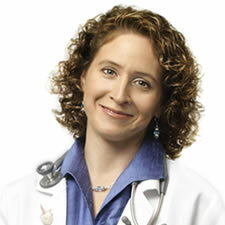 It’s worth noting that some doctors consider insulin resistance part of metabolic syndrome. Other doctors think that insulin resistance is a risk factor for metabolic syndrome. Metabolic syndrome is a group of risk factors that raises your risk for heart disease and other health problems and doesn’t seem to have a single cause. Lose weight and get active: If your weight isn’t at a healthy level or you’re inactive, losing weight and moving more helps your body respond better to insulin. One easy way to boost your activity is to find a partner who will join you for regular walk and talk sessions. (For more ideas on ways to get active, read my earlier Think Pink, Live Green column: When It Comes to Exercise, Just Do It. Eat a healthy, varied diet: Stick to real foods that are not processed or manufactured. Avoid foods that have a lot of refined carbohydrates and sugars and are low in fiber, including white bread, sugary cereals, potato chips, doughnuts, candy, and soft drinks.Instead choose foods with complex carbohydrates, especially ones with a lot of fiber, which take longer to digest and are less likely to spike your blood sugar. Good choices include grains like barley and brown rice and starchy or fibrous fruits and vegetables, like oranges, pears, yams, and cauliflower. One possible side effect of reducing refined carbohydrates and sugars in your diet: weight loss. Avoid environmental contaminants: Environmental factors also may play a role in insulin resistance. New research has suggested a connection between insulin-related conditions and environmental contaminants. One study linked phthalates to a doubling in the rate of diabetes. Phthalates are endocrine-disrupting chemicals commonly added to plastics to increase their flexibility. Phthalates are known to disrupt the body’s normal hormone balance. Other studies have linked bisphenol A (BPA) with obesity, which is a risk factor for insulin-related conditions. BPA is another endocrine-disrupting chemical. It’s found in hard plastics, in the coatings of food and drink cans, and on cash register receipts. When shopping for plastic items, try to buy items labeled phthalate-free and BPA-free. (Read more about avoiding BPA.The hazards of chemical exposures depend on a lot of things, including the amount of exposure (dose), the frequency of exposure, the duration of exposure, and your age when you’re exposed. Chemicals considered carcinogens usually require regular exposures over long periods of time to contribute to a cancer’s development. It can be a regular, low exposure over time or a large exposure for brief periods over time. We also know that certain times of life are more sensitive to chemical exposures than others. For example, exposure during adolescence, when you’re building your breast tissue, is called a “window of susceptibility.” That’s when you’re laying down the foundation of your future breast health. For adult women, after age 25 when breast development is done, the breast is more resistant to insults from the outside environment. But no matter how old you are, the foods, beverages, medicines, and personal care products that you take into your body from your outside environment can still influence how your cells are built and run. If something may pose a hazard, in the absence of solid research in people, we lean on the Precautionary Principle. This means that it’s better to be safe than sorry. Our goal is to help you make the best choices for you and your family. Learning about insulin resistance gives me yet another reason to clean up my diet and maintain a healthy weight. Is insulin resistance something that concerns you? If you’re at a weight that isn’t ideal, has your doctor talked to you about insulin resistance? I’m interested to hear your thoughts.